What is the purpose of MAVEN? MAVEN is the first spacecraft to focus primarily on the state of the upper atmosphere of Mars, the processes that control it, and the overall atmospheric loss that is currently occurring. Specifically, MAVEN is exploring the processes through which the top of the Martian atmosphere is lost to space. Scientists think that this loss could be important in explaining the changes in the climate of Mars that have occurred over the last four billion years. Why is climate change important on Mars? The present Mars atmosphere is composed almost entirely of CO2 and is about 1% as thick as the Earth’s atmosphere; surface temperatures average about 50°C below the freezing point of water. However, evidence suggests that this was not always the case. Images show features that were formed by liquid water, and chemical evidence from the Opportunity and Curiosity rovers suggests there was longstanding liquid water at the surface. If liquid water was present early in Mars’ history, perhaps life also existed. Scientists seek to understand why the early, warm, wet Martian climate became today’s cold and dry climate. Where did Mars’ thick early atmosphere go? The abundant water and carbon dioxide on early Mars have disappeared. They could either have been lost to space, or they could have seeped into the crust, forming H2O- and CO2-bearing minerals. Evidence tells us that both processes have occurred, but we do not know their comparative importance. MAVEN is exploring the importance of the historical loss of water and carbon dioxide to space. Is MAVEN looking for life on Mars? Determining whether Mars ever had life is an important goal of the NASA Mars exploration program. By exploring the presence of water and atmosphere through Martian history, MAVEN is helping to determine whether microbes could have survived on Mars in the past. Further discoveries concerning the actual historical presence of life on Mars will almost certainly require missions that return samples of the Martian surface to Earth for analysis. MAVEN carries eight scientific instruments devoted to understanding Mars’ upper atmosphere, but does not have a methane detector onboard. The Mars Science Laboratory (MSL) includes an instrument that is capable of detecting methane near the surface of Mars and the European Space Agency’s ExoMars Trace Gas Orbiter (launch date: March 2016) will attempt to address the question of methane in Mars’ atmosphere as well. Data collected by the Sample Analysis at Mars (SAM) instrument on the MSL Curiosity rover revealed no signs of methane in the near-surface Martian environment. Based on these results, scientists have calculated the amount of methane in the Martian atmosphere today must be no more than 1.3 parts per billion. Does MAVEN have a camera onboard? MAVEN does not carry a camera, but does have an Imaging UltraViolet Spectrograph (IUVS), which acts as the “eyes” of the spacecraft and provides global images of the Martian atmosphere. The IUVS on MAVEN is the most powerful ultraviolet spectrograph to be sent to another planet and is providing unprecedented details about the loss of water from the Martian atmosphere over time. Will MAVEN land on the surface of Mars? MAVEN is an orbiter, and is intended to focus on studying key components of Mars’ upper atmosphere to determine its current state, what processes control it, present day escape rates, and total loss of the atmosphere to space through time. Data from MAVEN will be combined with other Mars orbiters and surface assets to provide a comprehensive understanding of Mars’ climate history. How long will the MAVEN mission last? The primary science mission for MAVEN is designed to be one Earth-year (through October 2015). MAVEN carries enough fuel to extend its science mission for an additional 29 months and then another six years in a higher orbit, chosen to conserve fuel. In June 2015, the MAVEN mission was extended through September of 2016. This will bring the MAVEN mission cycle in synch with the wider planetary mission review process, planned in 2016, that will determine future mission extensions. Will MAVEN ever crash into Mars? MAVEN entered orbit around Mars on September 21, 2014, and is expected to operate in some capacity for up to a decade. Once all fuel for the mission is exhausted, the orbit of the spacecraft will experience a natural decay and MAVEN will enter the Martian atmosphere one final time. Despite the relatively thin composition of Mars’ atmosphere (it’s less than 1% as dense as Earth’s), MAVEN will largely burn up upon entry, but some of the material that comprises the spacecraft and its components is expected to survive this process and impact the surface of Mars. What measures were taken to keep Mars safe from contamination after impact? All spacecraft missions are responsible for complying with NASA’s Planetary Protection regulations, which were developed to avoid biological contamination in the process of exploration. MAVEN was assembled in a clean room and individual components were each cleaned in order to minimize the spacecraft’s “bio-burden,” or risk of contaminating the Martian environment during impact. The team performed a detailed analysis of how the spacecraft would break apart and burn up while entering the Martian atmosphere. This analysis included how hot components would get and what effect that temperature would have on any organisms. It is the combination of the initial bio-burden and the killing of organisms by heating upon entry, calculated on a component-by-component basis, that lets us determine how many organisms might make it to the surface. Models demonstrated that MAVEN would introduce fewer than 500,000 biological spores to Mars during atmospheric entry and surface impact, a figure that represents the maximum allowable by NASA based on international planetary protection treaties. 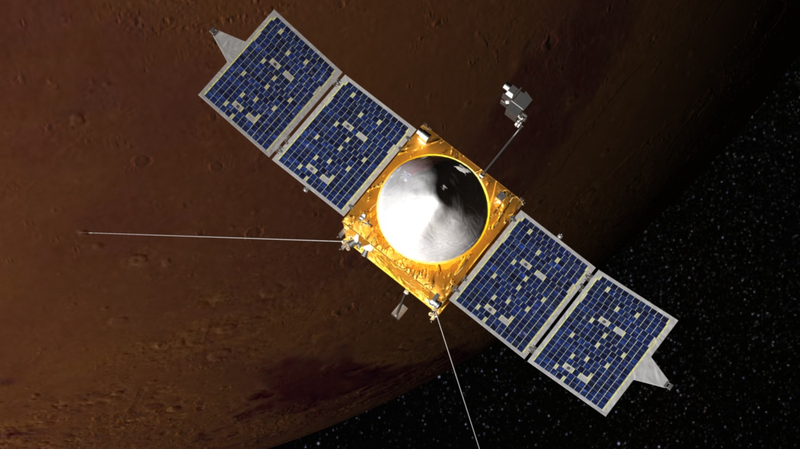 Does MAVEN serve as a communications relay for Curiosity and Opportunity? Like all orbiters NASA sends to Mars, MAVEN carries an Electra telecommunications relay package. MAVEN is designed to serve as a backup relay for present and future Mars surface assets (rovers and landers). Currently, Mars Reconnaissance Orbiter (launched in 2005) and Mars Odyssey (launched in 2001) are the primary communications relays for these assets. Click on the image to view a PDF (260 KB) of MAVEN FAQs.